As with any “best of” or “top ten” list—or any prize for that matter—the authority of an anthology like this one stands in direct contradiction to its essential arbitrariness. I think this is one of the few issues where I read every single story. I love being able to read the story then flip to the back and read where the inspiration for the story came from. The quality of the stories is, outstanding—which I guess is to be expected in a collection claiming to the Best of the year. Each one either grabbed me instantly or lured me into its world. As Jennifer Egan states, the stories in this year’s collection explore “the wider world at this specific point in time.” Reading them left me feeling more deeply connect to that larger world. 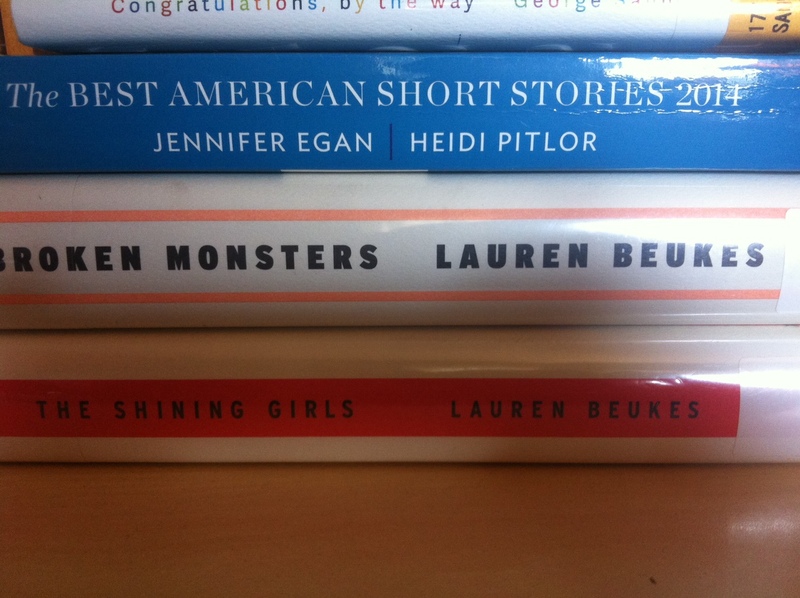 What I learned: How much I love love love short stories. Chances are, you’ve already read bits and pieces from this slim book. Quotes from Saunders’ convocation address at Syracuse University quickly began floating around the web. I think it is well worth it to read the entire speech. More than once. And probably many, many times throughout our lives. We can never be reminded enough that kindness matters. This book should be required reading for humanity. In these times of anonymous, ugly venom being spewed behind the cloak of a keyboard, of “news” shows that race each other to the lowest common denominator of civility, of politics that rarely show respect much less civility or kindness, of kids cyber-bullying each other because they feel empowered to post, tweet or text nasty stuff they would never say to a person’s face a reminder of the importance of kindness—the absolute necessity of kindness—is more important than ever. Thank you, Mr. Saunders for the reminder. What I learned: Kindness matters. He clenches the orange plastic pony in the pocket of his sports coat. At first glance, it seems like such a innocuous first sentence.but there is something disturbing as well. As soon as we learn who is clenching the toy pony, it is downright chilling. Harper Curtis is the man with the pony in his pocket. He has stumbled upon a Depression era house that allows him to travel through time, killing young women, who he calls “Shining Girls.” They are girls that have certain aura visible to Harper, an aura that lures him into their lives in order to snuff that light and life out of them. He collects objects from each victim, killing them in different decades, leaving a trail of clues that makes no sense if you are unaware of his secret. One girl, Kirby Mazrachi, one of his Shining Girls, ends up not dying after harper’s gruesome attack on her. Determined to piece together the puzzle of who tried to kill her, Kirby sets out on a quest to find answers, having no idea what exactly she is stepping into. Seriously—a page turner. The premise is so unique and her characters are so rich that I just could not put this one down. What I learned: A premise only takes you so far. The story needs rich characters and rich writing which this one definitely has. The body. The-body-the-body-the-body, she thinks. Detective Gabriella Versado is a single mom working in Detroit. This latest murder is grisly even for her city: half boy, half deer, somehow fused together. More strange combinations of bodies start cropping up. Her boss wants answers, as does the mayor not to mention the people of Detroit. And Gabriella is tasked with finding those answers. Her teenage daughter, Layla, heavily influenced by her daring friend, embarks on a dangerous on-line connection with a possible sexual predator. Jonno, a freelance journalist, still reeling from his latest heartbreak, is watching his career go up in flames around him. Desperate, he dives into the middle of these gruesome murders, determined to get the scoop. Then there’s TK, a homeless man, wanting only to provide for his family, finds himself on the trail of the monster terrorizing his city. Each of their stories are woven together to reveal a larger story of broken dreams, broken spirits, broken hopes all contained with a broken city. Another one that I could not put down. Beukes is able to weave compelling plot lines with richly textured characters. What I learned: Don’t be afraid to have many characters but make sure they all have a purpose and that each one is unique.